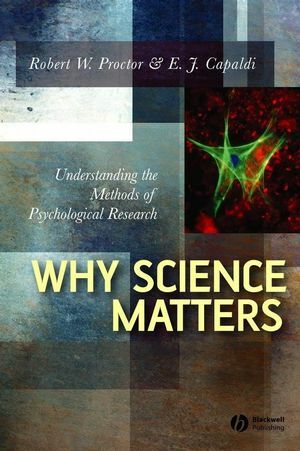 Why Science Matters: Understanding the Methods of Psychological Research rises above standard research methods texts by presenting an up-to-date view of contemporary psychological science as it is currently understood and practiced. Explores not only the procedural aspects of psychological research, but also delves into the issue of how to accomplish effective science. Explicates how hypotheses and theories are to be evaluated. Suggests that the proper approach to devising and evaluating theories is by abduction, not by induction or deduction alone. Incorporates new investigatory procedures, current methodologists, conflicts and issues, implications of the philosophy of science, and a lively prose style. Provides a picture of science that will engage students and expand their abilities as both scientists and psychologists. Robert W. Proctor is Professor of Psychology in the Department of Psychological Science at Purdue University at West Lafayette. He has been teaching and conducting research in the field of attention and human performance for nearly 30 years. His publications include Attention: Theory and Practice (with Addie Johnson, 2003) and Skill Acquisition and Human Performance (with Addie Johnson, 1995). E. J. Capaldi is Distinguished Professor of Psychology in the Department of Psychological Science at Purdue University. Dr. Capaldi is a leading researcher in the field of learning and memory. He is the co-author of numerous articles and contributor to books such as The Blackwell Handbook to Research Methods of Experimental Psychology. "This book is an excellent exposition of historical and contemporary issues in the philosophy of science, and is particularly useful for psychologists and other behavioral scientists. Its core ideas will be useful to students, practitioners, and researchers alike." "This book provides a comprehensive, fascinating, and up-to date account of what underlies the process of science. While there are many books on the nature of science written by philosophers, sociologists, historians and psychologists, this is the first volume that provides a sweeping vista of all these different approaches. Proctor and Capaldi have written a book that is a must-have for anyone who wants to understand the enterprise that we call science." --Kevin Niall Dunbar, Dartmouth College"This is a sophisticated, important, readable, and timely treatment of both the philosophy of science and the science of psychology. It would be a valuable addition to any advanced seminar on research methods in the behavioral sciences."